Over the next 20 years, Vietnam is expected to increase its electrical output through the diversification of its generation sources, the U.S. Energy Information Administration (EIA) announced on Monday. According the report, this growth in electrical output is falling in line with the country's attempt to become more of an industrialized nation. As a part of their energy plans, the country aims to increase its coal-fired capacity in addition to the construction of the region's first nuclear power plant and offshore wind farm. With additional generation sources the country will need to update its transmission and distribution infrastructure. 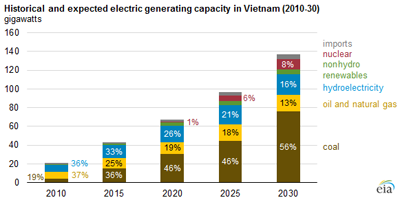 According to the report, state-owned utility Electricity Vietnam is pursuing modernized infrastructure and generation capacity simultaneously. The World Bank Transmission Efficiency Project has committed $500 million toward infrastructure modernization. The EIA reports that consumption of energy in the country is expected to rise as Vietnam adds more industrialization and export market expansion. Consumption is currently estimated at 169.8 terrawatt hours (TWh) for 2015 and could reach 615.2 TWh by 2030. The current generation capacity is approximately 40 gigawatts and would likely increase to approximately 140 gigawatts to meet increasing demand. Russia and Japan have agreed to construct reactors for Nin Thuan 1 and 2 facilities. Construction for the first facility is expected to begin in 2020. The Bac Lieu Wind Farm has its first phase of 16 megawatts in operation and the second phase, which is rated at 83.2 megawatts, is expected to be operational in 2016. Want to get notified whenever we write about US Energy Information Administration ? Next time we write about US Energy Information Administration, we'll email you a link to the story. You may edit your settings or unsubscribe at any time.